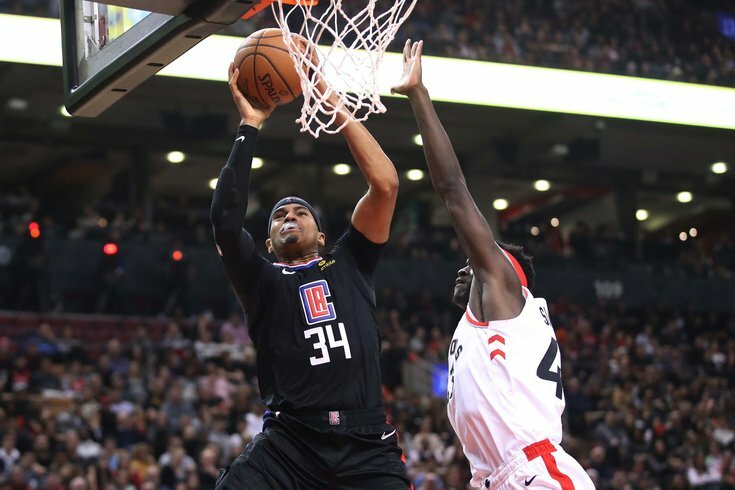 Los Angeles Clippers forward Tobias Harris (34) goes to the basket past Toronto Raptors forward Pascal Siakam (43) in the second quarter at Scotiabank Arena. If there was a point of criticism about Elton Brand's opening months on the job in Philadelphia, it's that he was idle for a while following the Jimmy Butler trade despite glaring needs on the roster. How could you leave a 15th roster spot open on a team with no depth? NBA Trade Rumors: What will fallout of John Wall injury be for Sixers? Any criticism of Brand on that front goes out the window after the team's staggering trade for Clippers forward Tobias Harris. It is a major risk, it is a major upgrade, it is a potential league-altering trade that gives Philadelphia a chance to compete for a championship right now. And it is a trade made with the intent of propping the window open right now. The Sixers' plan at this moment is to try to keep all four of their new quartet long-term, multiple sources told PhillyVoice, though that will obviously depend on a number of factors. The two sides had engaged on Harris talks for months, according to one source familiar with the trade talks, with Philadelphia seeing him as a great fit alongside the group already in place. Let's go through some of the ramifications of this trade, step-by-step. If you thought Philadelphia's starting five packed a punch before, just wait until you see them run out a group of Ben Simmons, JJ Redick, Jimmy Butler, Harris, and Joel Embiid. That group is going to be an absolute monster, and they cause problems for just about every team in the league. Harris' development as a shooter over the last few seasons has been one of the biggest trajectory changers for a player in the league. With his early career-numbers from deep, Harris would have been a productive player in the league for a long time. Now, he's one of the league's most accurate shooters on pretty high volume (43.4 percent from three on almost five attempts per game), and he joins a lineup that needs that ability in the worst way. When Redick is your fifth-best player in a lineup, teams are going to have major difficulties guarding all of your players. Look down the road to a matchup with the Boston Celtics, and you can now ask this question: how exactly do they guard Philadelphia? Is Kyrie Irving going to chase JJ Redick around screens for 48 minutes? Do they stick him on Ben Simmons and pray he doesn't abuse him in the post? Those are not fun questions for the Celtics to answer. Extrapolate that out to the rest of the league. By acquiring a big, athletic forward in a splashy deal, the Sixers have done exactly what they should have done no matter what caliber player they brought in – they leaned into their size without sacrificing skill. Harris can initiate offense for himself, serve as an elite catch-and-shoot option, and fill in whatever blanks the Sixers have left in the rotation. All the questions left have to deal with what Brand can do to fill out the rotation beyond this group. One advantage of building a "Big Four" is that the Sixers can now run 2-3 of them out there on the floor at all times without playing anyone too many minutes. If Brown commits to Butler at backup point guard, the Sixers can now run out bench looks that feature Simmons and Harris, instead of leaving Simmons to carry a group by himself, which he's not all that equipped to do with his lack of scoring juice. This is an upgrade to the top end of their defense on top of that. Harris is no lockdown guy, but he gives you a similar sort of frame as Wilson Chandler on the defensive end, in a younger and more athletic body. He'll hold up well on switches, and the Sixers can unleash Simmons on guards more on the defensive end with Harris capable of taking larger assignments. There won't be the same concerns about his body breaking down that you had with Chandler, so that's nice. Philadelphia now probably has the second-best starting five in the league behind Golden State. It's everything else that they need to worry about. All the above being said, the Sixers still have an obligation to go out and build a bench, and now it's more urgent than ever. This is a team that should be expected to make the Eastern Conference Finals at the very least, and you can't hang them out to dry with a terrible bench. The good news is that the players the Clippers sent along beside Harris will help a little bit. Mike Scott will take all of the backup four minutes vacated by Mike Muscala, and he's been a much better shooter this season than Muscala has been. Boban Marjanovic, who Embiid once marveled at following his first matchup against him, will take over the backup center minutes. Beyond that, they still need an upgrade in the guard department. T.J. McConnell's limitations have been put on display this season, and Brett Brown made clear on Tuesday night that it would be reckless for the Sixers to count on Markelle Fultz returning to the rotation. They should not be moving forward without a single guard who is a credible option to shoot. Speaking of Fultz, this move seems to cement that he is going to be on his way out of Philadelphia, whether that's before Thursday's deadline or this summer. From conversations with team personnel on Wednesday morning, Philadelphia's plan at this moment is to build around this core four of Embiid-Simmons-Butler-Harris, which has serious financial implications moving forward. The Sixers don't have much use for a player who is going to cost almost $10 million to keep next season on a team that needs all the money it can save to build out around that group. Even if the Sixers are only able to keep one of Harris or Butler in the summer, their commitment to winning now remains. They do not have the luxury of waiting around to hope a good player falls from the sky. Philadelphia's only avenue left to acquire a potentially useful player this season is to deal Fultz. I think this increases the urgency to move him before the deadline for a player (or perhaps two) that can provide them minutes down the stretch. Looking longer term, Philadelphia's ability to nail draft picks now becomes more important than ever. It's hard to judge this group because of all the front office shakeups over the last five years, but a pick they made last summer (Landry Shamet) and the trade to acquire the Miami Heat pick helped make a deal of this magnitude possible. Smart, future-focused drafting like that needs to be the norm, or Philadelphia will struggle to compete at the highest levels no matter how good their top five is. Philadelphia's high-end upside is now greater than ever. But that also hinges on the players in place taking the responsibilities they should following the move. The biggest loser here, from my view, is probably Butler. Acquiring Harris doesn't just add another player who needs shots and touches, it gives the Sixers summertime insurance if they decide they don't want to pay Butler long term. There have already been rumblings about the uneasy truce between both parties, and while they'll all say the right things publicly, the Sixers can now look at Butler and say they have another guy they're comfortable being their third banana, should he choose to walk. If Butler wants to win as badly as he claims he wants to, this puts the onus on him to flex his muscle on the defensive end and finally live up to a reputation he hasn't lived up to in Philadelphia. There is no longer as much pressure on Butler to carry them on offense for stretches, with Harris' offensive talents spreading the weight around there. But Butler's ability to stick guards matters now more than ever. He needs to take that challenge every night, not just on the ones where he feels like it. That's his path to earning a huge contract for this team in the summer, crunch-time scorer or not. This is not based on any reporting, but a simple read of the room. Ben Simmons is a Klutch Sports client who will now presumably take another step back in the offensive pecking order with Harris on the roster. Is that a situation he and/or his camp want him to be in long-term? If the Sixers are out winning titles, this sort of thing may be moot. Then again, Golden State has won everything there is to win over the last half-decade, and there are still credible rumors linking Kevin Durant to the Knicks this summer, and speculation about Draymond Green leaving eventually. Winning isn't always enough to keep the whole group happy, and for a player with Simmons' profile, I'm curious to see what drives him in the years to come. This all goes double for Butler, who has been a lot more vocal about demanding his share of the ball. He wants it in his hands, he wants it in the sets he likes to run, and he believes the time for that is always. That won't be the case on this team — there are mouths to feed and egos to placate. It's easy to dismiss concerns about usage and touches from the outside looking in. But the Sixers now have four guys at or near the top of their profession. Getting them all to buy in and fall in a perfectly-ordered line is not that simple. Brett Brown's reputation as a bridge builder is more important than it has ever been. Keeping this group together on and off the court is the biggest challenge of his coaching career. Can you take four players who rightfully believe they deserve the ball in their hands and make them happy? Time will tell. The Sixers now have a backup plan (or a potential partner) in the event things fall through with Butler in the summer. But they also must get Harris back here at all costs after the price they paid to obtain him in the first place. None of the assets the Sixers shipped out are worth all that much individually. But with a dearth of movable players and picks on the roster, they basically gave up the full boat. Shamet is a cheap, productive player, the unprotected Miami pick was long billed as imperative to acquire a star, and they're now down a lottery-protected first of their own. Brand's decision to push the chips in is a bold one, and Harris is a player who fits nicely with what they need and want to do. But Harris is an unrestricted free agent this summer. If he bolts after three months with the Sixers, they will look back in horror at giving up this much for a few months of a player whose best season put him on the fringes of the Western Conference All-Star picture. There's no guarantee that a guy in the prime of his career will be happy becoming a fourth option. When Brand has discussed the trade to acquire Butler in the months since it happened, he has mentioned feeling a responsibility to surround Embiid and Simmons with players that could help them compete right now. After having his best years as a player amount to little team success, Brand has done all he can to put high-level talent around his young stars in their second season. That's an admirable approach to take. Only time will tell if it was the smart one.